The “Design Sprint” is one of the fastest trending innovation and design thinking approaches I’ve seen in the past decade. It is now a part of our language to describe a specific kind of innovation session. This design sprint training article shares an overview of the process and resources you can use throughout. The design sprint concept has been made famous by Google Ventures in the book Sprint by Jake Knapp, John Zeratsky, and Braden Kowitz. It is a 5 day approach with specific activities each day of the week and each part of the day. I like it because it is something fun to learn and experience with a design sprint training workshop. The design sprint process seems like a combination of design thinking, lean startup, and agile for an approach to innovation that is rapid. You may have already heard about the Sprint book and the 5 day approach. BUT, did you know that there is also a 3 day design sprint kit from Google as well? 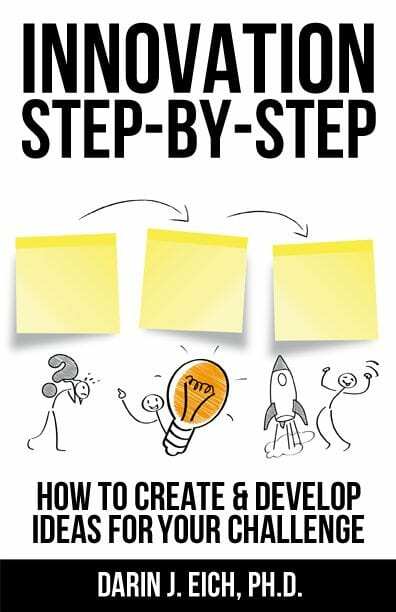 For this design sprint training resource we will focus on the 5 day format from the Sprint book since it is the most widely known with tools and resources we can use in design sprint training workshops. If you are looking for a design sprint facilitator or design sprint training, email us at darin@innovationtraining.org and we can recommend one of more than 10 excellent trainers or facilitators in our network across the globe. The design sprint is an important approach to innovation and quickly developing new products and services that customers want. It is becoming a popular trend in organizations and with designers and developers. It is also relevant to people of other roles since innovation is everyone’s business. Scroll through this article for a quick design sprint training guide. Consider getting the book (or at least the free toolkit and resources), participating in a design sprint workshop, or running your own sprint to learn through experience. 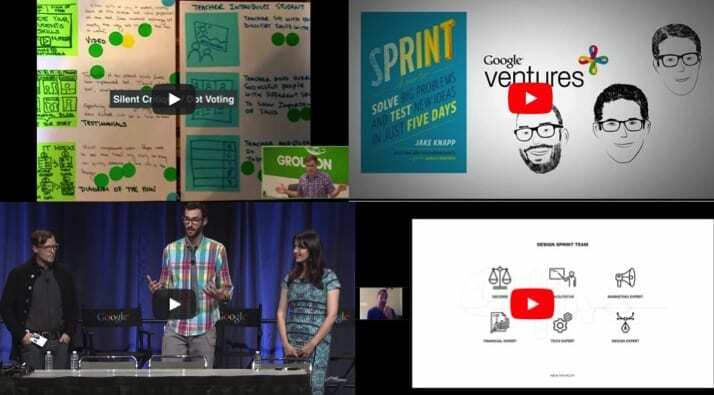 In the pure design sprint form that Google Ventures uses, these are the activities of each of the 5 days. In summarizing each day we will rely on the quoted description of each day from the original Sprint book source. “On Wednesday, you and your team created a storyboard. 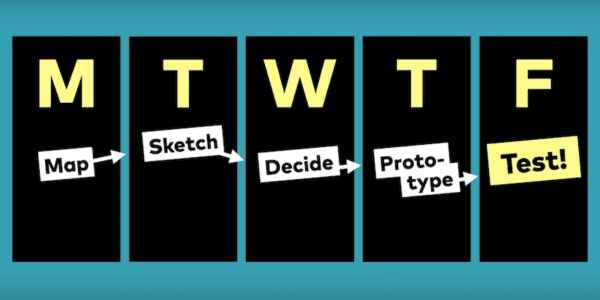 On Thursday, you’ll adopt a “fake it” philosophy to turn that storyboard into a realistic prototype.” The mindset, strategy, and tools, make it possible to build that prototype in just seven hours. What are your favorite design sprint resources? Just let us know in the comments at the end of the page. Do you need advanced help with a design sprint or need a workshop or training on this topic? We have a network of facilitators across the globe. Just contact us about what you are planning. I am an advocate of focus. The design sprint doesn’t spread out 40 hours of activities over a year or even a month. It focuses the activities in a week. Why wait a year or a month to do what you can do in a week? I also like how process-focused a sprint is. It not only breaks down what is done each day of the week but the specific activities in sequence with allotted time on each day. This is a specific playbook that one can take action on. It is practical. I also appreciate the approach that is agile in nature….hence the term sprint. A design sprint team is composed of about 5 people with specific roles (much like an agile SCRUM team in size with specific responsibilities to the team and project). A team can accomplish more than they think and having the structure of a time limit can help them to achieve. I also appreciate the focus on validating quickly and talking to real potential customers or users…and doing it very soon. Even with my background in qualitative research methods and qualitative data analysis, (and projects where I’ve interviewed over 100 people when starting a new product or service development challenge), it is very valuable and you can see themes and validation for your learning and decision making from interviewing just 5 people that represent your target persona or audience! Yes, many times you will learn the most important things to help you determine your innovation direction from the first 5 people you interview out of 100…so why not just do 5 and then iterate from there? The drawback of a design sprint is that it is a serious undertaking. Many organizations shy away from dedicating the energy of a team or even one individual for a full week straight. They tend to not take a focused approach and rather opt with weekly meetings, etc. A true design sprint will take a week! The good news is that you can involve another firm in helping you to run the sprint and many of these people will bring an outside perspective and experience with this sort of design thinking innovation approach. Organizations can often take months to create a new product concept…and many times that product concept was not validated by customer need or designed for what is most important to the business and customers. A design sprint can significantly shorten that timeframe into an intense 5 day period that is very productive. Five full days for a team dedicated to a design sprint is still more than many organizations or professionals can allocate. Our design sprint training workshops will show you this approach and how you can have more of a design sprint mindset and be able to get started with key activities. We can connect you to organizations who can run a full 5 day design sprint with you. We can also train you and introduce you to the key activities of the design sprint in our training workshops so you can get started on your own. We can also focus on shorter approaches to generating and developing ideas for and with your customers using the philosophy behind design sprints as well as design thinking, lean startup, agile, scrum, and the front end of innovation. The other day I was contacted for advice on what someone could do who had to create a 120 hour innovation workshop. This was a challenge. Most innovation workshops I’ve helped people to develop are a half day to 3 days in length. With the exception of a 200 hour program over 4 weeks, the longest program I offer is the equivalent to a 3 credit university course…about 45 hours in length. A Design Sprint as a training workshop could be a great thing to integrate into a longer program or course, especially one where you have a full week available to the students. Students could learn many great design thinking and agile approaches to innovation through the activities of the specific days! As a bonus, they may create a real solution or innovation they can take ownership of. Are you looking for a way to introduce your team or organization to design thinking or this approach of a design sprint? 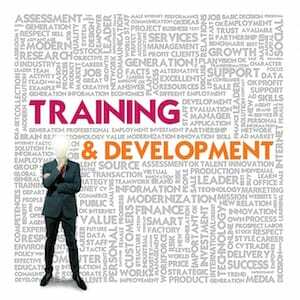 Contact Darin at sprint@innovationtraining.org for a design sprint training workshop to help your team gain awareness and hands on experience with this powerful approach to solve customer problems and design new products, services, and programs. We can also refer you to others who can help you with either learning for the first time or conducting your own design sprint. Well done, Darin. Great, concise summary of the five steps and a persuasive case for dedicating a week to a single, focused effort. Fast, productive, efficient.